Although housing affordability affects counties of all sizes in every region of the U.S.,4 each county is unique, facing its own set of obstacles and equipped with its own set of tools to navigate these obstacles. This toolkit, therefore, outlines the role of counties in addressing housing affordability, the extent of the problem and a variety of county-level solutions in four major categories: (1) inter-jurisdictional partnerships; (2) funding and financing solutions; (3) planning and zoning strategies; and (4) federal resources. Finally, the toolkit includes an appendix, which discusses common housing affordability metrics, reviewing their characteristics and limitations. This toolkit summarizes and builds on research conducted by the NACo Counties Futures Lab throughout 2018. Constituents in communities nationwide are calling on county elected officials to reduce the burdens of housing costs that force residents to relocate to more affordable neighborhoods. Although housing affordability is a shared priority across the country, available options to promote affordability vary widely between counties due to differences in jurisdiction and authority under state constitutions and statutes. Housing affordability is increasingly impacting central county operations. Recruiting and retaining employees is more difficult for counties without affordable housing options, leading many workers to seek employment in more affordable areas.14 Engaging the community on proposed developments and programs has become increasingly important as jurisdictions weigh competing priorities in resource allocation and land use decisions.15 Finally, as the issue of housing affordability has come to the fore, access to data to help design and evaluate community-specific programs has become an imperative. For more information on how counties are providing affordable housing for their own employees, visit www.NACo.org/AccessToHousing. 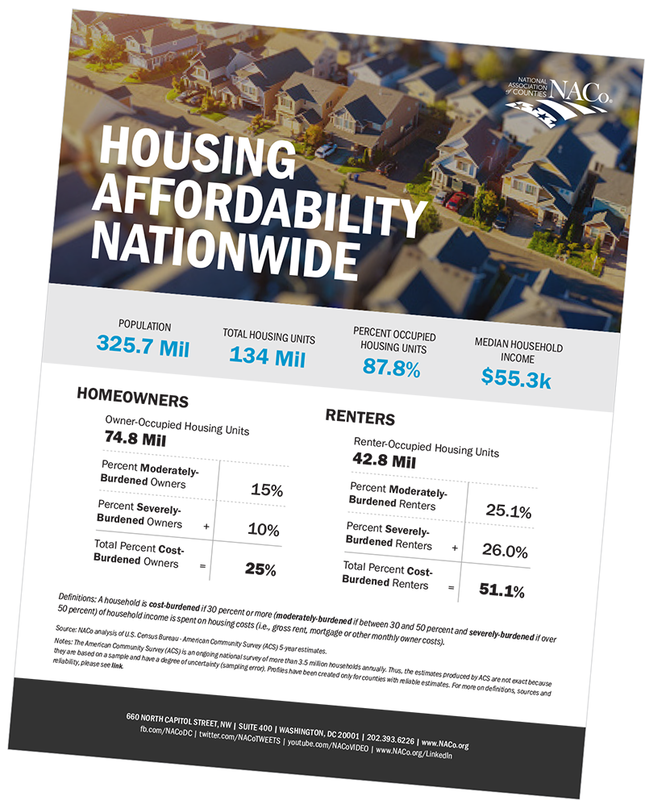 For more information on how counties can engage the community to promote housing affordability, visit www.NACo.org/HousingConnections. From 2010 to 2016, the number of cost-burdened renters increased by 13 percent. In 2016, more than half of renters - that is, 51 percent of renter households - in counties were cost-burdened. Between 2010 and 2016, the percentage of renters who were cost burdened increased by 13 percent. NACo’s County Explorer Housing Affordability Profiles are a compilation of selected indicators covering housing affordability challenges, housing cost burden trends, median household income, demographics and more for the 3,069 counties with county governments. Check out NACo’s County Explorer tool to find out more and compare your county across several indicators with other counties, your state, similarly sized counties or the median for the 3,069 counties. For more information on how challenges with housing affordability are spreading across the nation, see NACo County Explorer’s Affordable Housing Profiles at www.NACo.org/CountyExplorer. Inter-jurisdictional affordable housing programs are managed jointly between counties, cities and other governments. 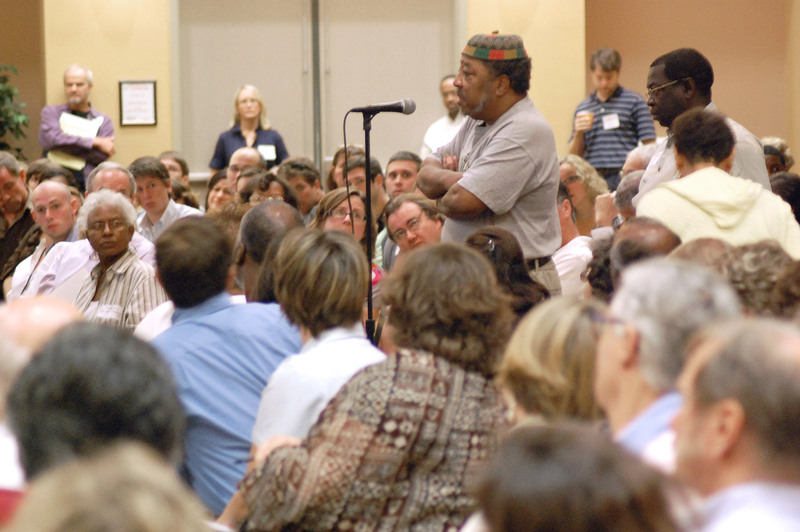 These programs, governed by inter-local or regional agreements, allow multiple organizations to more effectively tackle issues that expand beyond jurisdictional boundaries and authority.23 Since affordable housing is often a regional issue, inter-jurisdictional programs can have a more focused and strategic approach to by enhancing coordination, sharing information and generating additional funding resources. Over the past decade, more county governments have begun recognizing these benefits and working with other jurisdictions to create affordable housing. To maximize the potential of an inter-jurisdictional agreement, county leaders can conduct research to identify partnerships, funding sources and governance structures for new programs. Since the challenges of housing affordability are by no means confined to a particular municipality or county, county leaders can form partnerships and leverage the authorities of different levels of government to increase housing affordability. 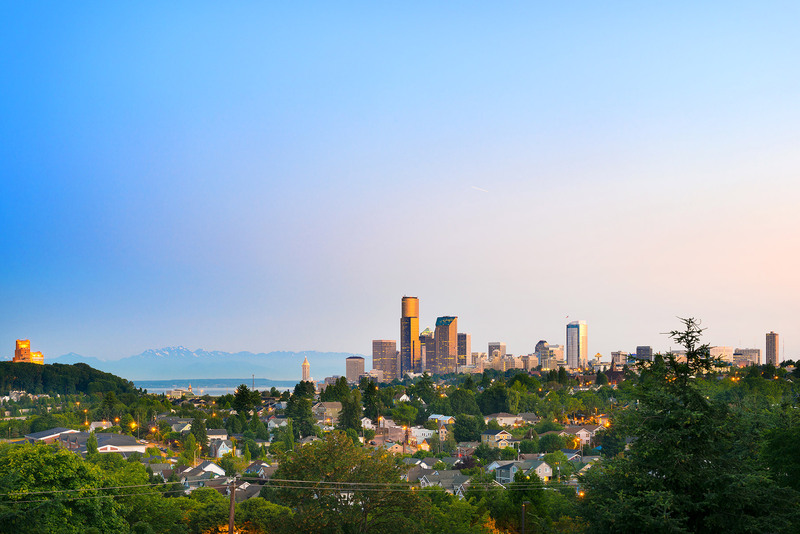 County Example: King County (Wash.) is a part of multiple alliances to create more affordable housing options for residents.26 The Puget Sound Regional Council is a regional planning body with representatives from over 75 jurisdictions. The regional plan developed by the Council is used by another organization established by inter-local agreement between 39 governments, the Growth Management Planning Council, to develop county-wide planning policies. In 2017, the county spearheaded the creation of the Regional Affordable Housing Task Force, led by six county and six city officials. County Examples: Apache County (Ariz.), City and County of Denver Community Planning and Development (Co.), Washtenaw County (Mich.), Bernalillo County (N.M.), Washington County (Ore.), Fremont County (Idaho), Erie County (Pa.), Shelby County (Tenn.), Salt Lake County (Utah) and Chittenden County Regional Planning Commission (Vt.) all received funding to build inter-jurisdictional affordable housing programs from HUD’s Sustainable Communities Initiative. 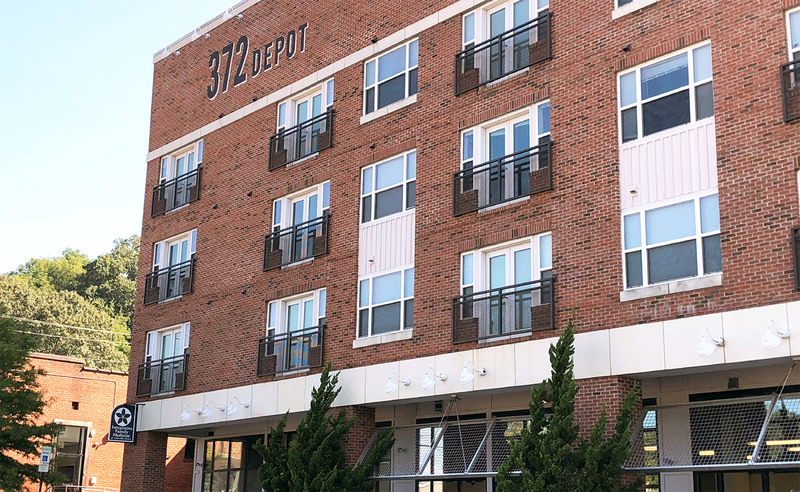 Ryman Lofts is Nashville-Davidson County’s first affordable housing development with a preference for people pursuing a career in the arts. Decreasing federal and state funding to counties for housing and community development have impelled many counties to look for innovative local funding solutions. Depending on state statute, counties have a variety of local funding sources they can use to leverage resources for affordable housing. Funding Source: Fees on short-term rentals; proceeds from any major sale of county property; county general fund; some federal funding, grants and donations. Housing affordability is a regional problem; thus, some counties are working on regional funding solutions to reduce the burden of housing costs for residents. Funding Source: Public-private partnerships; management of various properties; percentage of developer fees; LIHTC, HOME and private activity bonds for specific projects. Some counties are using their own local authority over taxes and fees to secure funding toward affordable housing. Commercial linkage fees: Imposed on commercial construction based on the need for additional workforce housing that the construction will generate. Developer impact fees: Based on the assessed impact of new developments on the demand for housing. Demolition fees: Charged to those demolishing affordable housing units. Fees on short-term rentals / hotel-motel taxes: For counties with large tourism industries, so visitors to the county help pay for tourists’ impact on housing costs for residents. The community owns land through a nonprofit, community development corporation, and residents lease the land from the CLT in exchange for lower costs for homes. Homeowners receive a portion of the increased value of the land when they sell their home. County Example: Nashville-Davidson County, Tenn.
For more information on funding solutions for affordable housing, visit www.NACo.org/BuildingHomes. Counties have a wide range of authority over planning, zoning and permitting, depending on state law. Not all county governments are permitted to allocate funding to build affordable units or to provide monetary incentives to developers, but many can use their authority over planning, zoning and permitting to incentivize affordable housing development without contributing much funding of their own. Counties typically create comprehensive plans to help guide responses to future population increases and economic development, while preserving their natural and cultural resources. Counties can include a housing element in these plans to evaluate their current housing stock – including its affordability – and predict future housing needs. County Example: Grand County’s (Utah) Affordable Housing Plan removed barriers to housing development and began to allow higher-density housing. Counties can evaluate future housing needs alongside the state of their current housing stock, then plan the type of housing residents will need. County leaders can analyze the location, type and cost of future homes and explore possible incentives to encourage developers to meet this future demand. County Example: Buncombe County (N.C.) Comprehensive Plan investigated regional housing and construction trends. County Example: Orleans Parish (La.) requires affordable housing impact statements from developers that help provide additional data that is used to better promote affordability in communities across the Parish. Counties that have robust community engagement infrastructure can better develop plans that will address the needs of residents who are burdened by housing costs. County Example: Development in Nassau County (N.Y.) is governed by plans that were developed through extensive community engagement efforts that are led by civic associations and smaller townships where residents are empowered to help the county and other governments make better decisions. Counties can modify their comprehensive plans and land use regulations to make it easier to build and to buy cheaper houses, thus expanding housing affordability for residents. County Example: Greeley County (Neb.) adjusted subdivision regulations in rural areas to allow one three-acre subdivision every quarter section. County Example: Buncombe County (N.C.) reduced the lot size needed to build home and reduced setback requirements. Counties can reduce requirements for building accessory dwelling units (ADUs). ADUs can often be a less-expensive housing option for residents who cannot afford a single-family home, as well as an easy way for a county to expand its housing stock. County Example: Grand County (Utah) adjusted its ADU regulations to allow ADUs to be built on smaller lots and removed a requirement that the owner must live in one of the units – allowing both units to be rented out. Some counties enact inclusionary zoning laws that require developers to build affordable units in certain areas, while other counties provide density bonuses to allow developers to build additional units in exchange for making a portion of these units affordable. County Example: Buncombe County’s (N.C.) Community Oriented Development (COD) program offers density bonuses for affordable housing, alongside other community benefits, such as using alternate energy sources or preserving open spaces. Counties can encourage the development of less expensive housing options by designating areas for medium-density zoning, where developers can build units in between the densities of single-family homes and apartment complexes, such as townhouses and duplexes. This not only introduces more affordable housing options, but also increases the overall housing stock, thereby decreasing housing prices. Counties can also use form-based code to regulate the outside structure of a home, rather than its internal use. Finally, they can use overlay zones to designate specific areas for affordable housing or higher-density housing. County Example: Grand County (Utah) implemented “high density housing” overlay districts so that developers can build medium- and high-density housing in areas of the county that have traditionally lacked affordable housing options. Counties sometimes have the authority to use county-owned land or existing buildings to expand the stock of affordable housing. County Example: King County (Wash.)’s regional transit authority makes surplus, locally-owned public land from the region’s light rail system expansion available for affordable housing development. The county also has a program to help provide financing for developers wishing to convert existing buildings into affordable homes. Some counties offer an expedited review and permitting process for developments that include affordable housing, while others reduce or waive fees for developers building affordable units. For more information on county planning, zoning and land use strategies for addressing housing affordability, visit www.NACo.org/PlanningAhead. Grand County, Utah, zoning map of proposed high density housing (HDH) overlay districts for employed, full-time county residents. The legend refers to maximum densities per acre (e.g., HDH25 refers to a maximum of 25 units per acre). The 2018-2019 platform reflects many housing-related items that are important to NACo members.34 Members support flexibility in administration and increased funding for the Community Development Block Grant (CDBG) Program that will allow federal, state and local priorities to be met. The platform emphasizes the need for affordable, workforce and entry-level housing, as well as more federal funding to support county efforts to comply with increased administrative requirements, such as the updated Affirmatively Furthering Fair Housing rule. Recommendations outline the roles state and county governments can adopt to better finance affordable housing programs. The platform also urges the federal government to allow stable long-term coordination and funding between federal, state and local governments to better promote affordability. In response to these priorities, NACo developed several resources on federal affordable housing programs. Housing affordability is a challenge that counties across the country are facing now and will continue to face in the future. Since each county is unique, there is no “one-size-fits-all” solution to housing affordability that every county can implement. Rather, county leaders will continue to work with local communities to develop solutions that best fit their situation. County governments should take advantage of the numerous tools available to them by utilizing a combination of inter-jurisdictional partnerships, community engagement, local funding solutions, planning and zoning strategies and federal grants to increase housing affordability. NACo will continue to evaluate various strategies and solutions to address housing affordability for counties of all sizes. 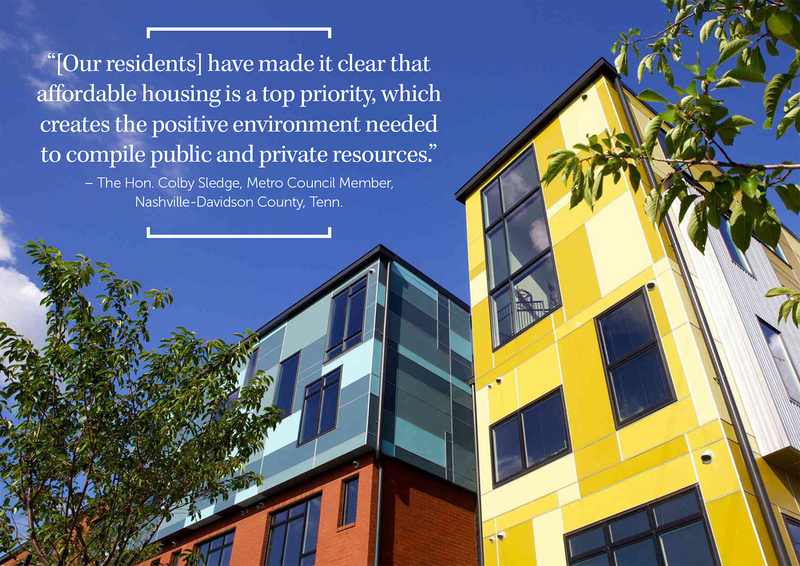 Housing is recognized as a key determinant in achieving positive health outcomes. High housing cost burdens, alongside poor quality of existing stock, exacerbate existing inequalities and disparities, especially in terms of individual health and wealth. By increasing housing affordability for residents, counties are also decreasing health risks and driving wealth creation for residents, especially for those who are most vulnerable. The standard method for measuring housing affordability is the housing cost-to-income ratio approach, also known as the “30 percent of income rule.” This approach assesses housing costs as a percentage of the household income, designating households that spend more than 30 percent of their income on housing costs alone as cost burdened. The underlying notion of this approach is that a household’s income must cover all necessities, and that cost-burdened households must make tradeoffs between housing and other necessities. As a result of spending more on housing, these households may not have enough left to meet their other needs. Although the housing cost-to-income ratio approach has been widely adopted in academic and public policy circles, some researchers have criticized the use and validity of this traditional measure in the current housing market, namely because of variations in non-housing costs across different income levels. According to the Harvard University Joint Center for Housing Studies, the costs of necessities generally do not rise with income, so high-income households can devote a larger share of their income to housing and still meet their other needs than can low-income households.35 For example, a household that earns $650,000 annually may be able to spend 50 percent of their income or more on housing and still have enough for other necessities, while a household that earns $30,000 annually may not have that same luxury. Another criticism of the housing cost-to-income ratio approach is that it does not take into account that different households earning similar annual incomes may have different needs. For example, households with children spend more on clothing, food, and medical bills in comparison to households with single adults.36 Thus, a household with children that spends more than 30 percent of its income on housing might be cost burdened, whereas a single adult who earns the same salary and spends the same percentage of income on housing might not be. Furthermore, the housing cost-to-income ratio approach does not consider cost-of-living differences between areas and regions of the country. For instance, a family in Los Angeles County (Calif.) that earns $30,000 annually and spends 40 percent of its income on rent may not have enough left to cover all other basic needs such as food, health care and transportation, while that income level may be sufficient for a family in a county with a lower cost of living. Including other expenditures that take up a large share of household income—such as transportation—alongside the standard approach for measuring the affordability. The National Association of Realtors (NAR) affordability index measures whether a median-income family could qualify for a mortgage loan on a typical home. 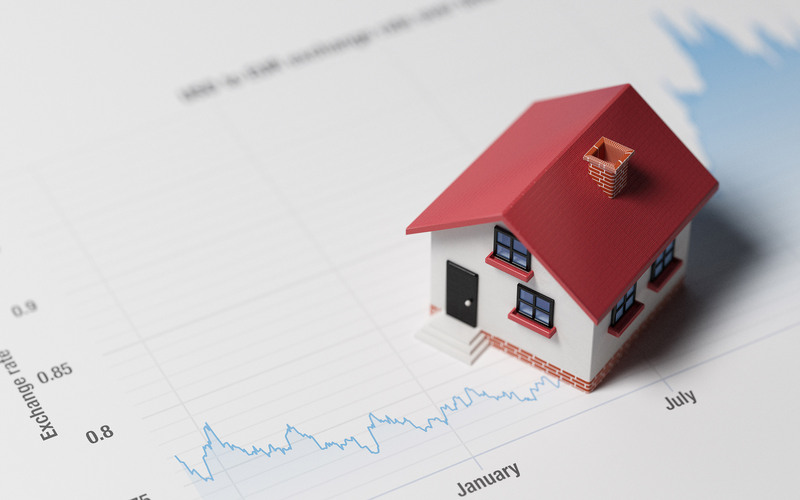 The components of this measure include median prices for existing single-family home sales and the principal and interest related to a mortgage rate. The National Association of Home Builders’ (NAHB) Housing Opportunity Index looks at income and housing costs to measure the share of homes sold in an area that would have been affordable to a family earning the area median income. This measure includes property taxes and insurance costs in addition to the principal and interest payment. The Center for Neighborhood Technology (CNT) Housing + Transportation Index (H+T) measures housing affordability for regional typical householdsby considering transportation costs associated with local neighborhoods. CNT developed a new benchmark of 45 percent of income which combines the 30 percent standard and a 15 percent transportation affordability threshold. CNT posited this new standard because transportation costs are the second largest expenditure for households. The HUD Location Affordability Index (LAI) combines housing and transportation costs to measure affordability for various income groups. Researchers can obtain data on housing affordability from various sources. The HUD Office of Policy Development and Research lists numerous datasets that can facilitate housing affordability research. HUD provides a Housing Affordability Data System (HADS) of housing-unit level datasets which measure the affordability of housing units and the housing cost burdens of households relative to AMIs, poverty levels and Fair Market Rents. HADS contains data from the American Housing Survey (AHS) – a survey conducted by the U.S. Census Bureau every two years which contains a wide range of housing information, such as housing inventory, vacancies, physical condition of housing units, characteristics of occupants, neighborhood quality and other variables that impact affordability. Among other sources, the number and share of cost-burdened households can also be computed using data from the U.S. Census Bureau’s American Community Survey (ACS) or the University of Michigan’s Panel Study of Income Dynamics—a nationally representative study of the source of U.S. families’ income. ACS contains detailed data about housing and other socioeconomic information for a variety of geographical areas, ranging from nationwide to census block groups. ACS samples nearly three million households annually and provides one-year estimates for geographies with a population of 65,000 or more, three-year estimates for geographies with a population of 20,000 or more and five-year estimates for all geographies. Please explore the following compilation of resources below to learn more about the strategies that counties are using and can leverage to address affordable housing. NACo’s Counties Futures Lab released two reports covering community engagement and partnership practices for affordable housing development. Access to Housing: Supporting County Workers Through Affordable Homes examines how affordability affects county government employees and provides examples of strategies that counties can adopt to recruit and retain talented workers. Housing Connections: Promoting Affordability Through Community Engagement examines effective community engagement practices counties can employ to encourage community participation in the creation, evaluation and development of affordable housing programs. NACo County News has also released several articles covering county efforts to (1) combat not-in-my-backyard sentiments regarding affordable housing development, (2) create affordable workforce housing in resort towns, (3) foster political will and collaboration among state and local programs to address chronic homelessness and (4) collaborate with local organizations to bolster workforce development and meet housing demand. Additionally, Local Housing Solutions’ toolkit Build a Strong Coalition to Support Housing Initiatives, provides numerous resources that describe important connections stakeholders should make in shaping housing initiatives. The Housing Alliance of Pennsylvania also released a toolkit to give affordable housing developers a working knowledge of fair housing and provide hands-on tools to manage public hearings, build community support, leverage media coverage and work with public officials. Finally, Lisa Sturtevant & Associates released a report analyzing techniques that state and local government agencies can use to collaborate on housing initiatives, and improve housing choice and authority. NACo’s Counties Futures Lab released its first report covering affordable housing titled Building Homes: County Funding for Affordable Housing. Presenting an analysis of housing affordability at the county level, how it affects county government operations and how counties are best-positioned to address affordable housing challenges; the report also features three best practice case studies of counties that are implementing innovative solutions across the nation. NACo County News has also released several articles covering county efforts to fund affordable housing initiatives through land trusts and addressing affordable housing shortages following natural disasters. Other county cases include the offering of tax credits to support the rehabilitation of historic buildings. Furthermore, Local Housing Solutions’ toolkit Funding a Local Housing Strategy, describes policies that cities, towns and counties can adopt to generate funding for the creation and maintenance of their affordable housing stock. The NACo Counties Futures Lab report Planning Ahead: County Planning, Land Use and Zoning Strategies for Affordable Housing explores the role of counties in planning for development and in enacting zoning and land use ordinances that encourage the construction of affordable homes. The report features case studies from Grand County (Utah), Buncombe County (N.C), Greeley County (Neb.) and King County (Wash.). NACo County News has also released several articles covering county efforts to add to their affordable housing stock through (1) a rural enterprise zone program, (2) the implementation of inclusionary zoning, (3) offering financial incentives to buy, rent or build homes to attract new residents, and (4) designing affordable housing policies that account for zoning regulations and strict preservation rules in the county. Additionally, Local Housing Solutions published three toolkits to assist counties with creating a comprehensive housing strategy, identifying policy tools to address local housing needs, and assess and refine housing strategies. The University of Miami published a housing policy toolkit for the Miami metropolitan area, and LA Metro released a toolkit to help localities develop affordable housing near transit. Survey of Market Absorption (SMOA), U.S. Census Bureau – sponsored by the U.S. Department of Housing and Urban Development – estimates the rate at which newly completed multifamily rental units, condominiums, and cooperatives are rented or sold. Building Permits Survey (BPS) and Survey of Construction (SOC), U.S. Census Bureau, provide data on new residential construction and new housing that is authorized but not started, started, under construction, and completed. Low-Income Housing Tax Credit Database, U.S. Department of Housing and Urban Development, provides data on new and rehabilitated properties placed in service that used the credit. Housing Research Repository, National Low-Income Housing Coalition, offers synopses of research papers and reports related to housing affordability and cost burden, as well as a detailed list on housing-related data produced by other organizations. Inter-University Consortium for Political and Social Research (ICPSR) provides a large library of social science datasets, including those related to housing. Enterprise Community Partners is a housing organization that offers resources such as policy development, financing and original research publications to foster the development of affordable housing. The National Housing Conference’s research division conducts research and produces publications on housing affordability, trends and projections in housing demand and the intersection of housing with outcomes such as health, education, economic mobility and growth. The organization also offers online tools such as Paycheck to Paycheck, which analyzes the ability of households to afford typical housing in metropolitan areas across several occupations, and the Housing Landscape Portal, which provides an analysis of housing affordability challenges. NACo Analysis of the American Community Survey (ACS) five-year estimates, U.S. Census Bureau. Calculated using only housing units in counties with county governments for which selected monthly owner costs as a percentage of income were available. NACo County Explorer data, 2018. NACo categorizes counties according to population size. Large counties have more than 500,000 residents, medium-sized counties have between 50,000 and 500,000 residents and small counties have less than 50,000 residents. NACo County Explorer data, 2018. See Jonathan Harris and Stacy Nakintu, “Building Homes: County Funding for Affordable Housing,” National Association of Counties (May 2018). Matthew Sellers, et al., “County Authority: A State by State Report,” National Association of Counties (2010). Jonathan Harris, “Planning Ahead: County Planning, Land Use and Zoning Strategies for Affordable Housing,” National Association of Counties (September 2018). Aaron Ridings, “Access to Housing: Supporting County Workers Through Affordable Homes,” National Association of Counties (July 2018). Aaron Ridings and Stacy Nakintu, “Housing Connections: Promoting Affordability Through Community Engagement,” National Association of Counties (October 2018). NACo Analysis of the American Community Survey (ACS) five-year estimates, U.S. Census Bureau. This includes counties with county governments. NACo Analysis of the American Community Survey (ACS) five-year estimates, U.S. Census Bureau. NACo Analysis of the American Community Survey (ACS) five-year estimates, U.S. Census Bureau. The share of severely-burdened homeowners was 12 percent in the West and Northeast, 8 percent in the South and 9 percent in the Midwest. Susan Longworth, “When Neighboring Jurisdictions Collaborate on Housing” Federal Reserve Bank of Chicago (August 2012), available at https://www.bostonfed.org/publications/communities-and-banking/2012/fall/when-neighboring-jurisdictions-collaborate-on-housing.aspx (December 12, 2018). Snohomish County Tomorrow, “Feasibility Study of Inter-jurisdictional Housing Programs for Snohomish County,” available at https://snohomishcountywa.gov/DocumentCenter/View/8172/Feasibility-Study-of-Interjurisdictional-Housing-Programs (December 12, 2018). See Alliance for Housing Affordability, available at https://snohomishcountywa.gov/DocumentCenter/View/8040/Alliance-for-Housing-Affordability?bidId (December 12, 2018). Department of Housing and Urban Development, “Regional Planning Grants and the SCI,” available at https://www.hudexchange.info/programs/sci/ (December 12, 2018). Stacy Young, “The Avenue: Making Strong Housing Markets Affordable with Private, Public and Long-distance Partners,” Brookings Institute (January 2018), available at https://www.brookings.edu/blog/the-avenue/2018/01/29/making-strong-housing-markets-affordable-with-private-public-and-long-distance-partners/ (December 12, 2018). See Matthew Cardinale, “Affordable Housing Impact Statements: A Policy Opportunity for the City of Atlanta,” Gonzaga University School of Law (November 2014), available at http://mediad.publicbroadcasting.net/p/wabe/files/AHIS_Report_for_Atlanta_FINAL_version.pdf (December 12, 2018). See the National Association of Counties’ Committee on Community, Economic and Workforce Development, available at https://www.naco.org/advocacy/policies-and-committees/community-economic-workforce-development-steering-committee (December 12, 2018). See National Association of Counties’ Committee on Community, Economic and Workforce Development. ”Policy Platform and Resolutions 2018-2019,” available at http://www.naco.org/sites/default/files/documents/2018-2019%20American%20County%20Platform_CEWD_0.pdf (December 12, 2018). Christopher Herbert, Alexander Hermann and Daniel McCue, “Measuring Housing Affordability: Assessing the 30 Percent of Income Standard,” Joint Center for Housing Studies of Harvard University (September 2018), available at http://www.jchs.harvard.edu/research-areas/working-papers/measuring-housing-affordability-assessing-30-percent-income-standard (December 12, 2018). “Rental Burdens: Rethinking Affordability Measures,” PD&R EDGE, available at https://www.huduser.gov/portal/pdredge/pdr_edge_featd_article_092214.html (December 12, 2018). A typical household earns median income for the region, has the average household size for the region and has the average commuters per household for the region. The authors would like to thank Eric Alexander (Nassau County, N.Y.), Hon. Bill Baertlein (Tillamook County, Ore.), Hon. Claudia Balducci (King County, Wash.), Kelly Butler (Orleans Parish/City of New Orleans, La. ), Hannah Choi (Loudoun County, Va.), Donna Cottrell (Buncombe County, N.C.), Sarah Coyle Etro (Loudoun County, Va.), Josh Fornwalt (Loudoun County, Va.), Cynthia Fox-Clark (Buncombe County, N.C.), Margo Geffen (Hennepin County, Minn.), Francisco Gomez (San Mateo County, Calif.), Adriane Harris (Nashville-Davidson County, Tenn.), Markus Klimenko (Hennepin County, Minn.), Hon. Jeanne Kohl-Welles (King County, Wash.), Zacharia Levine (Grand County, Utah), Morgan Mansa (Nashville-Davidson County, Tenn.), Mark Mayfield (Texas Housing Foundation), Kaitlin Myers (Grand County, Utah), N.C.), April Norton (Teton County, Wyo. ), Nathan Pennington (Buncombe County, N.C.), Kelly Rider (King County, Wash.), Debbie Truempy (Buncombe County, N.C.), Franz Trumler (Greeley County, Neb. ), Evlyn Tsimis (Nassau County, N.Y.) and Hon. Suzanne M. Volpe (Loudoun County, Va.) for providing essential information and comments for this study. Without them, this project would not have been possible. Within the National Association of Counties, the author would like to thank Ricardo Aguilar, Sarah Crump, Daria Daniel, Michelle Price and Hadi Sedigh for their helpful comments and contributions. The authors also express their appreciation to their Public Affairs colleagues for the graphic design and the website of the report.